The experiment undertaken by the British Geological Survey (BGS) consisted of a 1D gas injection test performed on a pre-compacted Mx80 bentonite sample supplied by Clay Technology AB (Lund, Sweden), see Table 1 for the sample dimensions and geotechnical parameters and Daniels and Harrington (2017) for a detailed description of the sample preparation and laboratory procedure. Table 1 Sample dimensions and geotechnical parameters. As reported by Daniels and Harrington (2017), a constant volume pressure vessel, with a hollow steel cylinder and two detachable end-closures, was used for the testing (see Figure 2 and Harrington and Horseman 2003, for a general description of the employed apparatus). The pressure vessel was instrumented with (i) 2 axial and 3 radial load cells and (ii) 3 radial arrays comprised of 4 spot-filters in each, which allowed the continuous monitoring of pore pressure within each array, see Table 2 for their relative positions. The test comprised two stages; hydration of the sample (Stage 1) followed by gas testing (Stage 2). 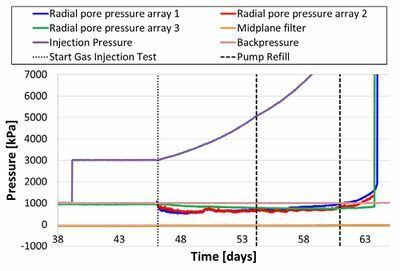 After gas breakthrough and a period of gas flow through the sample, the injection pump was stopped whilst the swelling pressures (stresses) and pore pressures were continuously monitored. Table 2 Relative positions of load cells and pore pressure filters. Figure 2 The experimental apparatus and sample assembly. After installation, the sample was allowed to equilibrate with the water in the radial filters and backpressure end-closure filter for a period of 7.3 days, providing sufficient time for the sample to develop enough swelling pressure so that the external pore pressure could be applied. Following this, the sample was allowed to hydrate for a further 32 days until total stress had approached a well-defined asymptote, see monitored stresses and pore pressures for this period in Figure 3 and Figure 4 respectively. Figure 3 Swelling pressure measured by the axial and radial load cells, injection pressure and backpressure. Figure 4 Axial and radial pore pressure for the first 40 days. Gas testing began on day 39. Additional helium was added to increase gas pressure to 3 MPa. This was then held constant for a period of 7 days to allow the system to equilibrate and to help identify significant leakages. 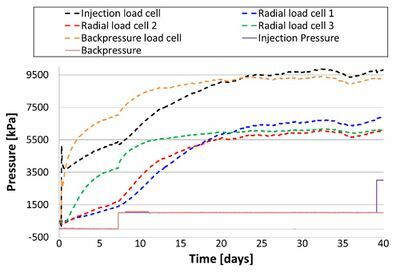 At day 46, the injection pump was then set to a constant flow rate of 500 μl/h and the injection pressure gradually increased for the next 8 days from 3 MPa to 5 MPa whilst the volume of fluid in the injection pump decreased from 102.7 ml to 6.25 ml. At this point (day 54), the fluid in the injection pump was refilled and the flow rate was reduced to 375 μl/h. At day 61 (before the pressure in the injection filter reached the breakthrough pressure), further helium was added to the interface vessel. As such, the injection pump volume increased, see Figure 5 and Figure 6 for the evolution of total stresses and pore pressures. Figure 5 Total stress up to gas breakthrough at 63.5 days. Figure 6 Pore pressures up to gas breakthrough at 63.5 days. Gas breakthrough occurred at 63.5 days. Interestingly, the increase in pressure in the array closest to the injection face lagged behind those of the other two arrays, suggesting non-uniform gas flow. At day 71, the injection pump was stopped. 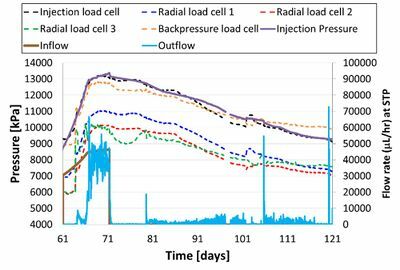 Between day 71 and day 76, the pore pressures decreased substantially, see Figure 7. 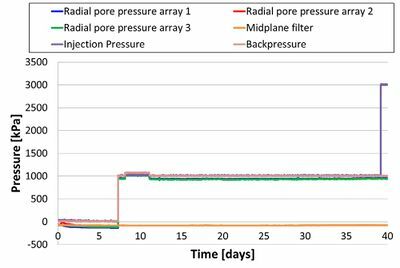 Figure 7 Injection pressure, backpressure and radial pore pressure transducer data from day 61 to day 121. 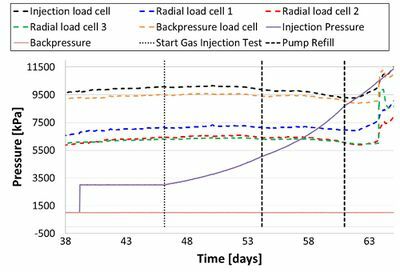 Examination of the axial and radial load cell data during gas entry and breakthrough, Figure 8, indicates that the swelling pressure (stress) within the sample increased at the same time as gas breakthrough occurred in the backpressure filter. Following gas breakthrough, the system approached a quasi-steady state as gas pressure approached an asymptote and flow in and out of the system began to converge (between days 63.5 and 71). The dip in pore pressure seen in Figure 7 between days 71 and 81 also corresponded with a dip in total stress, and an apparent reduction in outflow. This event appears to occur close to the cessation of pumping. 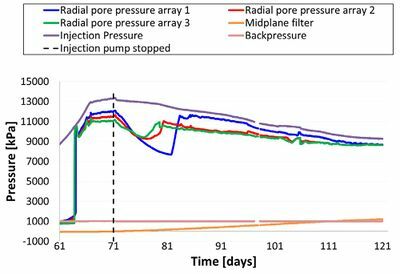 However, by day 81, pore pressures rebounded suggesting the cessation of pumping is not the cause for the spontaneous change in pore pressure. Following gas breakthrough, total stress and pore pressure appeared integrally linked to the gas pressure within the clay. This is in line with previous observations (Harrington and Horseman, 2003; Harrington et al., 2017a). This continued following the cessation of pumping, as gas pressure and total stress and pore pressure began to decay. During this phase of testing, outflow was sporadic suggesting new gas pathways continued to open and close during this phase of testing. Some of these outflow events correlated with observed changes in total stress and pore pressure, while others did not. Figure 8 Total stress and flow data from day 61 to day 121. ↑ 1.0 1.1 Daniels, K A, and Harrington, J F. 2017. The Response of Compact Bentonite during a 1D Gas Flow Test. British Geological Survey Open Report, OR/17/067. 19pp. ↑ 2.0 2.1 Harrington, J F, and Horseman, S T. 2003. 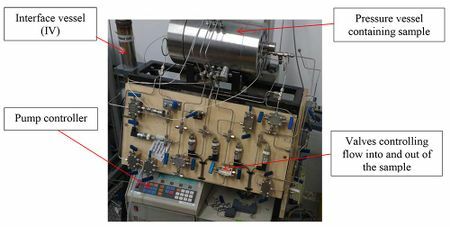 Gas migration in KBS-3 buffer bentonite: Sensitivity of test parameters to experimental boundary conditions. Report TR-03-02. Svensk Kärbränslehantering AB (SKB), Stockholm, Sweden.